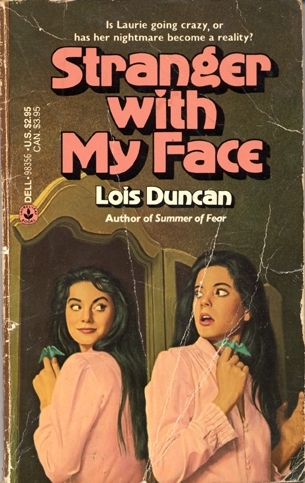 The book was Stranger With My Face by Lois Duncan. I was thirteen or fourteen. That little snippet of paper (I cut out just that sentence – I refused to ruin the whole book) stayed taped to my mirror for years. I can clearly see it there, on the left side of the mirror, slightly higher than where the tops of my perfume bottles ended. It was out in the open, but safe in my room. Like religion. Like a little secret that’s not a secret. A prayer you say aloud. Like the way a slip of paper from a fortune cookie can feel like your own personalized map to salvation. When I read the words, I stopped. I was impressed. I had the feeling that something important had happened. These words must mean something just for me, I thought, something no one else appreciates. After all, the book had been checked out many times by all my friends and their older sisters, and no one else had yet to cut it out. The little block of text yellowing in the sun stayed taped to my mirror for years. I can still quote it in my head, and when I picture it, everything about my old bedroom starts coming back to me, from the teal walls to the four framed note cards from Mimosa bookstore. It’s amazing the impression a really good sentence can leave. What’s your favorite, most unforgettable line you’ve ever read? Next PostWho owns a river?